Very unlucky in both the PLO's. In the 1r I had the guy committed drawing to 2 outs, and he got there, for a top 10 stack. We min-cashed that for $8.65. In the 5K PLO, turned the nuts with a pot sized bet left and shoved, the guy snapped it in with top set and paired the river... again for a top 10 stack. No money there. Out of the 10K and the main event satty... shoved AT on 11bb's into QQ (opener was playing 40/20) in the 10K, and in the satty also 11bb, shoved 99 into AA and KK behind me lol. Not my night I guess. We have one live, the 4K, maybe we'll get the better of some of these spots here. Out of the 4K, making an aggressive play on a loose player, and ran into the very top of his range unfortunately. Def not my night. Out of the 1r/1a unfortunately... no chance to use the add on so that will be refunded as well. I actually like these, for a couple reasons. 1- The people late reg'ing right at the end are paying a full buy in for a 6bb stack or whatever tiny amount relative to the blinds... this is basically extra dead money in the prize pool. If the events weren't making the guarantees, this would be a negative for me (someone who could get lucky, without adding to the prize pool as there was an overlay anyway). But since they are going over the guarantees I think it's good to have the prize pool padded by microstacks, it's in our favor. 2- Occasionally, not often but once a while, the field has dwindled so much that you are already ITM or really close to it at the end of late reg. For the astute observer, this is free money to reg with 1 minute to go. I haven't seen it in this series, but I've done it once prior... it was a $5.50 event and there was like 6 to go til the money I noticed, so I late reg'd it, and didn't even have to pay a blind before the bubble burst. It was only a couple bucks profit, but it was free... this doesn't come up if there's no extended late reg. Thanks for the sweat and rail, sorry we didn't end up in profit but it is what it is, MTT poker does include variance. Here we see another truth about tournament poker. 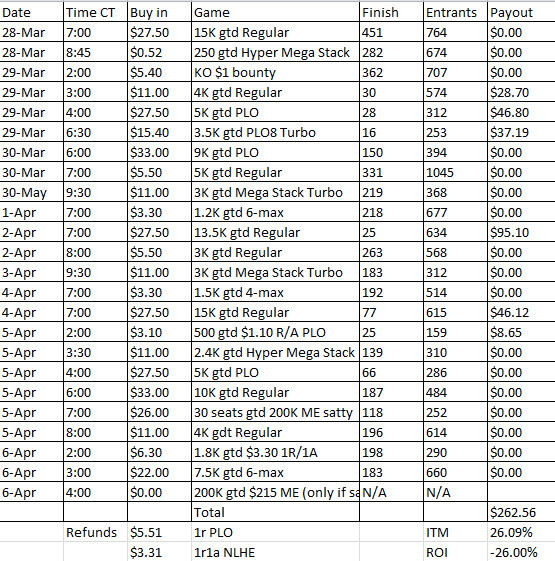 26% ITM is "good", but we had a - ROI for the series... this is why serial min-cashers are losing players at tournaments. The big money is at the top. I got in the money in 6/23 events, and would gladly trade 5 of them back for a ship. I know some of you have ACR accounts set up, if you paid via ACR transfer I will send back that way... if you did paypal or sent through Cat, but would like your $ shipped on ACR, please let me know ASAP as well as your user name there. JWK24, Sailor Moe, Sandtrap have been shipped on ACR. This leaves outstanding only TrumpinJoe and wetmoose, both of which I've held because they may want it via P2P transfer on ACR instead of their original payment method. Let me know which it is guys. Joe is shipped. Just waiting on moose for his preferred method. Moose is shipped on ACR. Everyone should be paid now! Those who paid via Cat please allow time for her to redistribute, I pinged Dale on skype to let him know the money was sent but he hasn't replied yet, so they might be out for the evening. We have transferred USD 1.36 from your account to 'BUZZLIYEAR' as per your request. We have transferred USD 2.71 from your account to 'steveisnot' as per your request. We have transferred USD 1.36 from your account to 'stevopick' as per your request. We have transferred USD 8.14 from your account to 'gatehouse999' as per your request. We have transferred USD 6.78 from your account to 'EasyChips4U' as per your request. A very big thanks to the Russian and his Babooshka for the help. Sorry bit behind. Money received. Really enjoyed the railing! Thanks for your efforts Dave. And thanks to Dale and Cat for all the money messing about. Dale asked too... not sure, but when I see they've posted another series, I may put something up.